The signs of construction at Surrey Memorial Hospital are not unusual, as the hospital continues to grow along with the health care needs from across the region. 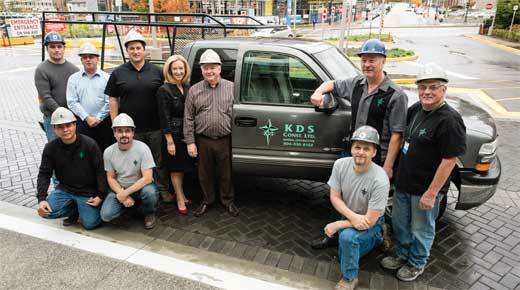 Surrey-based KDS construction has been part of the changing landscape at Surrey Memorial for more than 15 years, working on projects like the expansion of the Mata Tripta Family Birthing Unit and improvements to the operating rooms. Vice-president Marvin Kale and President Kelly Shannon both live in Surrey. They believe in the importance of giving back to local causes that their employees can also get behind, whether that's a donation to Surrey Memorial Hospital Foundation or a hamper for the hungry. The Family Birthing Unit expansion and improvements were funded by Fraser Health and donors to the 2013 RED FM Radiothon. When the KDS crew was nearing the completion of this project, Marvin and Kelly were inspired to make their own corporate donation to Surrey Memorial Hospital Foundation for the birthing unit. Why? "I've been a member of the Langley Kinsmen for more than 20 years," Marvin notes. "Giving back personally or as a company is the right thing to do. Companies and individuals need to do what they can within their means, whether it's donating time as a volunteer or making a cash donation." Marvin's own experience as a volunteer also influenced the company's rescue of the Surrey Memorial Hospital Auxiliary when a thief stole $5,000 in lottery tickets a few Christmases ago. He read about the Auxiliary's loss in the Surrey Now and KDS stepped forward with a corporate donation to replace the lost revenue. "I know how hard those volunteers work to earn the funds to give back to those in need." KDS is currently hard at work on improvements to the Sterile Processing Department, where equipment, instruments and other supplies for sterile procedures are cleaned and sterilized. It's no wonder that their employees feel connected to the hospital – projects in acute care facilities have to be carefully carried out in stages to respect the needs of the patients and staff in a 24/7 operation. The most disruptive work has to be done at the least disruptive time. KDS invests in special training through the Canadian Health Care Engineering Society (CHES) to help its employees meet some of the unique challenges of working in an active health care environment. For example, the wooden hoardings that you see in the hospital hallways during construction projects must be carefully installed to eliminate dust and odours and meet or exceed the hospital's stringent infection control needs. For the original PDF release from the Surrey Hospital Foundation, please click here.